PATIENTS WITH METASTATIC CANCER OF UNKNOWN PRIMARY SITE: DIAGNOSTIC WORKUP AND THERAPEUTIC MANAGEMENT Majeed H Alwan FRCS, FACS, Gastrointestinal and General Surgeon, Wellington Hospital, Wellington, New Zealand Abstract Metastatic Cancer of Unknown Primary site (CUP) accounts for about 4% of all cancer patients and is therefore one of the 10 most frequent cancer diagnoses in man. It is defined as biopsy-confirmed malignancy for which the site of origin is not identified by routine workup. It is believed that CUP represents a heterogeneous group of malignancies that have a presumably, specific biology with clinical characteristics of rapid progression and random atypical metastases. The diagnostic work-up could be variable. Certain clinicopathological CUP entities are considered as favorable subsets responding to systemic platinum-based chemotherapy or managed by locoregional treatment. These subsets have a better prognosis than the average median survival time of four months in patients who belong to the non-favorable subsets. EVALUATION OF ABDOMINAL BULLET INJURIES IN BASRAH GENERAL HOSPITAL (A PROSPECTIVE STUDY) Jabar K Jassim#, Mazin H Al-Hawaz@, Mazin A Abdellah& #FICMS Candidate, Basrah General Hospital, @Professor of Surgery, Head of Dept.of Surgery, College of Medicine, Basrah. &CABS, Basrah General Hospital, Basrah, IRAQ. Abstract The incidence of civilian abdominal gunshot wounds is on the increase in many cities, attributed to the increasing rate of unemployment, high rate of corruption in the polity, and political violence. Gunshot wounds of the abdomen are associated with 90% or greater incidence of intra abdominal injury, prompting many trauma centers to routinely explore these patients via laparotomy. The aim of this prospective study was to evaluate the pattern of injuries, treatment, and outcome of patient with abdominal gunshot wounds in Basra General Hospital. 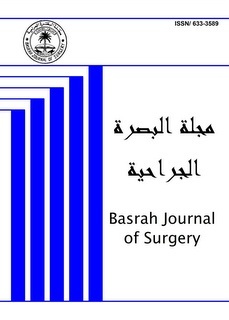 This is a prospective study of patients with abdominal gunshot wounds admitted to Basra General Hospital, Department of Surgery, between April 2003 to October 2005. One hundred and sixteen patients were included in this study. Data recorded on database. Patient's characteristics, injury to arrival time, type of weapon, single or multiple gunshot wounds, surgical intervention time, clear urine or macroscopically haematuria, preoperative and postoperative blood transfused, operative finding, and postoperative complications and mortality. The indications for emergency laparotomy after vigorous resuscitation were shock, peritonitis, evisceration, leakage of intestinal content through wound, haematemesis, proctorrehagia, and macroscopical haematuria with entrance wound. The study included 116 patients, Male:Female ratio was 4:1 and 44.8% of patients ranged in age from 20-29 years. The common weapon used was gun in 88.8%patients. Three (2.6%) patients sustained superficial wounds of the abdomen; they were managed by local wound care. Laparotomy was undertaken in 113 (97.4%) patients who presented with acute abdomen. The commonest injured organ was the small intestine (26%), colon (18.8%), liver (11.7%), kidneys (9%) and stomach (6.7%).The mortality rate was 10.6%. shock was the cause of death in 9 patients. It is concluded that Bullet injury is a serious injury which need careful attention by surgeon .Mandatory exploration is the standard method for managing patient with gunshot wounds to the abdomen and back;. Most of the deaths in this study are due to haemorrhagic shock. The unavailability of blood in our hospital blood bank and the delay in bringing blood from the central blood bank add adverse effect on the outcome of patient. MANAGEMENT OF SPLENIC ABSCESS Ma’moon A Khalid#, Adnan Y Abdul-Wahab@, Kusai Z Mohammad& # Candidate of FICMS, Al-Sader Teaching Hospital.. @ FRCS Assist.Prof. of Surgery, Dept. Of Surgery, Basrah College of Medicine.&CABS, General Surgeon, Al-Sader Teaching Hospital. Abstract Splenic abscess is a rare clinical entity with an incidence of 0.2 to 0.7% in autopsy based studies. untreated splenic abscess is associated with nearly 100% mortality. This study aimed to clarify the risk factors and management of splenic abscess. This is a retrospective and prospective study of patients with splenic abscess treated at Al-Sader Teaching Hospital over a six-year period. Ten patients were managed. they were six males and four females aged range 11 to 31 years, duration of symptoms ranged from 2 to 30 days. the main symptoms were fever, chills, left hypochondrial pain, anorexia and weight loss and the main physical signs were; Left upper abdominal tenderness, splenomegaly, hepatomegaly and distension. Six patients were treated by antibiotics and splenectomy. Three patients were treated by antibiotics and open drainage of the abscess and one patient was treated conservatively by antibiotics. It is concluded that prompt diagnosis and treatment based on high index of suspicion will reduce the high morbidity associated with this rare disease. it is hoped that as appropriate skills and imaging techniques become more available in our country more splenic abscess could be managed by percutanous drainage specially when there is a solitary abscess cavity. ROUX-EN-Y ESOPHAGOJEJUNOSTOMY AFTER TOTAL GASTRECTOMY FOR GASTRICMALIGNANCY. Hashim S Khayat# & Safwan A Taha* *CABS. Professor, Dept. of Surgery, University of Basrah, College of Medicine; #FRCS Ed. Consultant Surgeon and Chairman, Basrah General Hospital, Basrah; IRAQ. Abstract Out of 62 patients who underwent total gastrectomy for gastric malignancy, 40 patients had roux-en-y esophagojejunostomy. Their age ranged from 32 to 70 years. Seventeen patients were less than 60 years old and 27 were older. There were 23 males and 17 females. Operations were done through thoraco-abdominal incisions in 28 patients and upper midline incisions in 12. The anastomoses, on the other hand, were hand sewn in 34 patients and stapled in the other 6. The procedure included splenectomy in 37 patients, distal pancreatectomy in 6 and transverse colectomy in 2 patients. Postoperative complications included chest infection (8 patients), wound infection (7 patients) and anastomotic leak (1 patient). Eleven patients died postoperatively, the leading cause being pulmonary embolism, respiratory failure and over-whelming sepsis. Out of our surviving patients, 4 (10%) are still alive 5 years or more after surgery and are enjoying good health. Our results are well within the international figures although we think that the outlook could have improved had we gained access to certain facilities like hyperalimentation, chest physiotherapy units and measures that could prevent deep venous thrombosis. Roux-en-y esophagojejunostomy is a safe method to restore the continuity of the alimentary tract after gastrectomy. It requires less time than “pouch-forming” procedures, has less incidence of anastomotic leakage, produces acceptable morbidity and mortality, gives good nutritional value and does not require the special expertise needed to perform the “pouch-forming” procedures. AGE AND GENDER VARIATION IN INTRAOCULAR PRESSURE Khalid I Almearaj DO, CABO. Lecturer in Ophthalmology, Department of surgery, College of Medicine, University of Basrah, Basrah � Iraq. Abstract During the last 7 years, the intraocular pressure (IOP) of 7000 males and females of different age groups were measured by Goldmann applanation tonometer. The results show a statistically significant decrease of IOP with age after the age of 30 years. They also show a higher reading in females than in males after the age of 40 years. THE ROLE OF ALLERGIC RHINITIS IN THE AETIOLOGY OF NASAL POLYPS Hashim AL-Abdul Wahed*, Husam Haider# *CABS, FICMS. ENT Dept., Basrah general hospital, Basrah, Iraq, #FRCS, DLO. ENT Dept. Basrah Medical College, Basrah, Iraq Abstract Despite the prevalence and long history since nasal polyps were recognized as a clinical entity, many questions still exist with respect to their aetiology & pathogensis, this study aims to assess the role of allergy in the aetiology of nasal polyps based on their epidemiology in Basrah governorate in Iraq & by utilizing the skin test, from January 2000-december 2000 84 patients with simple nasal polyps 50 males & 34 females with age range between 18-70 years were studied by collecting data regarding the history, physical examination& investigations in a questionnaire form .88 normal subjects were also included as a control group. Both patients & controls were subjected to intradermal skin test using seven common aeroallergens. Out of the 84 patients 58 (69%) had a positive skin test to one or more of the tested allergens, while only 20 (23%) of the control group had a positive test. This difference is statistically significant (p<0.00001), odd ratio=8.0 which means allergic persons were 8 times more prone to have polyps than normal subjects. Allergy appears to play an important role in the aetiology of nasal polyps and the skin test is useful in the assessment of patients with polyps who may therefore benefit from immuno therapy. CORRELATION OF OVARIAN VOLUME IN WOMEN WITH POLYCYSTIC OVARY SYNDROME (PCOS) WITH CLINICAL AND HORMONAL FINDINGS Hayfa Al- Shaheen MB,ChB, DGO, CABGO, Department of Obstetrics & Gynecology, Basrah Maternity and Child Hospital Abstract The aim of this study is to evaluate the ovarian morphological findings in infertile women given the diagnosis of polycystic ovarian syndrome (PCOS) based on chronic anovulation (menstrual disorders) and evidence of hyperandrogenism (hirsutism & acne), and whether clinical and selected hormonal findings correlate with ovarian volume. Over 12 months period (from 1st of Jan 2005 till the 1st of Jan 2006), the ovarian morphology were determined by transabdominal ultrasound in107 patients included in this prospective study in infertility clinic in Basrah Maternity and Child Hospital. Clinical and endocrinological state was evaluated by history, physical examination and measurements of serum testosterone, Luteinizing hormone (LH), follicle-stimulating hormone (FSH), prolactine and progesterone levels. Their ages ranged (18-40 years), mean (27.28 ± 4.4) and their mean body mass index (BMI) was (29.77± 4.0 kg/m2). Ultrasound studies showed all women studied (100%) had altered ovarian morphology (both ovaries had multiple small cyst of (2-9mm), mean total follicular number (12.3±1.7) & thick capsule. Bilaterally enlarged ovaries were found in 84 (78.5%), mean (15.6± 2.04 cm3) and normal ovarian size were found in 23(21.5%) mean (6.6± 1.1 cm3). All patients who had enlarged ovaries were compared with those who had normal ovarian size regarding clinical and hormonal findings in order to determine a possible association between these findings and ovarian volume. Hirsutism was present in (78.5%), acne in (68.2%), Obesity (BMI>25 kg/m2) in (87.8%), menstrual disorders in (100%), manifested as oligomenorrhoea in (77.6%) and secondary amenorrhea in (22.4%). Comparing these clinical findings between patient who had enlarged ovaries and those who had normal ovarian size, this study has confirmed that hirsutism, acne and obesity were significantly higher in women who had enlarged ovaries the values were: (84.5% versus 56.5%), (73.8 %versus 47.8%) and( 92.9% versus 69.6%) respectively, whereas oligomenorrhoea occurred more frequently in women with normal ovarian size (82.6% vs. 76.2%), the difference was statistically non significant p.value>0.05. No significant relationship was found between ovarian volume and amenorrhea. Analysis of biochemical data showed that women with PCOS were found to have elevated Serum testosterone levels (1.3±0.74ng/ml ), elevated LH (11.80 ± 4.2 miu/ml ) and elevated LH/FSH ratio (1.90 ± 1.03) whereas all women were found to have normal prolactin levels (10.8 ± 4.0ng/ml). Comparing these hormonal levels between women who had enlarged ovaries and those who had normal- sized ovaries we found that serum testosterone, LH & LH/FSH ratio were significantly higher in women who had enlarged ovaries. Subtle differences existed between ovarian volume in hypretestosteonemic & hyperluteinizenemic subgroups of polycystic ovarian syndrome compared to normotestosteronemic & normoluteinizenemic ones. With significant relationship was found between the ovarian size and testosterone & LH levels p. value< 0.05. A significant differences also existed between ovarian volume in elevated LH/FSH ratio subgroup of polycystic ovarian syndrome compared to normal LH/FSH ratio ones. P. value 0.001. Whereas no statistical significant difference was found between ovarian volume and FSH levels. Hirsutism, acne and obesity correlated positively with total ovarian volume (r=0.282, p- value 0.002), (r=0.229, p- value 0.009) (r=0.372, p. value 0.0001) respectively. While Oligomenorrhoea and amenorrhea showed negative correlations with total ovarian volume. Total ovarian volume correlated positively with Serum testosterone levels, LH and LH/FSH>2, (r=0.518, p- value 0.0001), (r=0.563, p- value 0.0001), (r=0.266, p- value 0.01) respectively. It can be concluded from the present study that ultrasound scanning provide a non- invasive and accurate procedure for the assessment of ovarian morphology (specifically ovarian volume). Correlation of ovarian volume in women with polycystic ovary Hayfa Al- Shaheen Bas J Surg, September, 12, 2006 And when clinical diagnosis of PCOS was made, virtually all women were found to have characteristic ovarian morphology that extending from apparently normal to markedly enlarged cystic ovaries. Hirsutism acne, obesity, serum testosterone levels, LH and LH/FSH ratio correlated sssstrongly with increased ovarian size. These results allow us to suggest that ovarian size > 10 cm3 in women with PCOS with hyperandrogenism & menstrual disorders might be predictive of endocrine profiles, and emphasized the importance of careful assessment of ovarian volume by Ultrasound. CHEST WALL TUMOURS Abdul-Khalik Zaki Benyan*, Adel Makki#, Zuhair Fadhil Fathallah@, *FRCS, Professor, Cardiothoracic and vascular surgeon, Basrah College of Medicine, #FICMS, Cardio-thoracic and vascular surgeon, Basrah Teaching Hospital, @MSc, Plastic Surgeon, Basrah College of Medicine Summary Thirty one patients were referred to the cardiothoracic unit at the Teaching Hospital in Basrah between 1998-2002. All patients were assessed, operated on then followed up in the outpatient clinic. They were 17 females and 14 males, their age range from 7-70 years. Fourteen patients had benign tumours and 17 had malignant tumours, ten of them had primary malignant tumours, and 7 had metastatic tumours. All patients with benign tumours were presented with painless chest wall swelling, while those with malignant tumours presented with painful swelling. The locations of the tumours were in anterior chest wall in 15 patients, in the lateral wall in 12 patients, while the posterior wall is the site in 4 patients. Thirty patients underwent surgical resection of the tumours, 14 patients had rib resection, and the number of the resected ribs was determined by the size of the tumour and range from 1-4 ribs. Reconstruction of the defects was performed by using Marlex mesh covered by cutaneous or myocutaneous flaps there were no operative deaths. Hospitalization days range from 4 to 14 days. Post operative complications occurred in 6 patients, which include wound infection in 5 patients and acute bronchitis in one patient. Recurrence of the tumours developed in 9 patients, all those with benign tumours are alive while 12 of those with malignant tumours whether primary or secondary are dead due to metastasis. The aim of this study is to prove that malignant chest wall tumours need an aggressive approach with wide resection in order to have effective treatment. TUBULARIZED INCISED PLATE URETHROPLASTY (SNODGRASS) FOR HYPOSPADIAS REOPERATION Hazim R Akal FICMS(Urol), Lecturer, Dept.of surgery, Medical College, Thiqar University Abstract Reoperation for failed hypospadias has been considered to be seriously bothersome because abundant penile skin doesn’t tend to remain for urethroplasty or for penile shaft skin coverage. in this study, the tubularization of incised urethral plate was employed for those who had no excessive penile skin after failure of hypospadias repair. Between June 2003 and February 2006, 18 boys, (4.5-18) years old, underwent tubularized Incised-Plate (TIP) for previously failed hypospadias repair. The hypospadias defects included 9 (50%) distal (coronal or subcoronal), 5 (27.5%) distal penile and 4 (22.2%) mid shaft defects (three of them have residual chordee),13 patients had one operation and 5 had two operation previously. all patients did not have foreskin because of the previous surgery. There was not apparent scarring of the plate. The operation was successful in eleven out of 13 (84.5%) patients who had undergo one operation before and 3 out of 5 (60%) of patients with 2 operation previously as well have sufficient outcome. Complication was observed in 4 patient. The absence of preputial skin in reoperative cases makes tubularized incised-plate urethroplasty the ideal operation. In addition, this procedure can give excellent functional and cosmetic results however the patients require revisional hypospadias surgery. The technique has few complications as well as proved success and versatility that continue to expand its applicability and popularity. URETHROPLASTY IN POSTERIOR URETHRAL INJURIES SABAH A. AI-Kadi & SAFAA A. Mohssin Department of Urology, University of Baghdad, Iraq. Abstract To assess the efficacy of urethroplasy (excision with end to end anastomosis) in posterior urethral injuries. Fifteen patients with complete urethra! disruption were treated by this method and followed with objectives and subjectives parameters for 2 years. The results are graded into 3 grades (excellent, satisfactory and poor) according to continence and flow rate of urine, 80% of cases have stricture (>2 cm) in length. Those patients who are treated with perineal approach result in (92%) excellent, in comparison to those with transpubic urethroplasty who give only (50%) excellent results. Patients with no history of urethral handling give (100%) excellent results, while only (25%) excellent results in patients with previous urethral surgical intervention. Urethroplasty is the best method for repairing completely obliterated strictures. Intraoperative endoscopic checking of posterior urethra is important to avoid fistulous tracts. Dilatation and urethrotomy may be used as complementary procedures to urethroplasty. Pubectomy sometimes necessary in complicated cases. UNUSUAL PRESENTATION OF A COMMON DISEASE Mazin A Abdullah*, Noori H Jasim#, Furat Shani@ *CABS, Lecturer, Dept of Surgery, College of Medicine, University of Basrah. #FICMS, Lecturer, Dept of Surgery, College of Medicine, University of Basrah, @CABS, Lecturer, Dept of Surgery, College of Medicine, University of Basrah Abstract This study aimed to describe the clinical features of acute rupture of hydatid cyst in the peritoneum. We retrospectively studied 7 patients who underwent explorative laparotomy between January 2002 and October 2005, and in whom exploration confirmed the rupture of hydatid cyst in the peritoneum. Rupture was secondary to trauma in 2 patients, and occurred spontaneously in 5 patients. All patients presented with acute peritonitis, and anaphylactic shock developed in 4 patients. One patient died postoperatively. Ultrasonogrophic diagnosis was made in 3 patients. Surgical treatment consisted of the treatment of peritonitis, the ruptured hydatid cyst and evacuation of the free intraperitoneal hydatid fluid. All patients kept on albendazole. Acute rupture of hydatid cyst in the peritoneum should be considered when evaluating acute abdomen in endemic areas. ENDOSCOPIC INJECTION OF DILUTED ADRENALINE FOR TREATMENT OF BLEEDING DUODENAL ULCER IN COMPARISON WITH SURGERY. Jawad R Khersani CABS, FICMS, Lecturer, Dep.of Surgery, University of Basrah, College of Medicine, Specialist Surgeon, Basrah General Hospital Abstract Peptic ulcer disease is a common and life threatening emergency. The management of patients with bleeding gastroduodenal ulcer (BGDU) has evolved over the past two decades. For many years, surgery was the only treatment for BGDU. Endoscopic techniques have emerged as a successful alternative with constant improvement. Endoscopic therapy is effective in controlling 80-95% of actively bleeding ulcers and it lowers the mortality rate from BGDU by 30-40%. No study has compared surgery with endoscopic therapy; most trials of endoscopic therapy define the need for a surgical operation as a treatment failure of endoscopic haemostasis. Aim of our study is to evaluate endoscopic treatment of bleeding duodenal ulcers using injection of diluted adrenaline in comparison with surgical treatment. This is a prospective study conducted at Basrah General Hospital during the period between Jan.2004-July 2006. Twenty patients were treated by endosopic injection of diluted adrenaline (1:10000), the injection group (group I), compared with 28 patients treated by surgery, the surgically treated group (group S). The mean age was 55 and 57 years in I group and S group respectively. There were no statistically significant differences in demographic, clinical and endoscopic findings between both groups. High rate of successful initial haemostasis was achieved in group I (95%). Injection therapy failure was encountered in one patient (5%) while other two patients (10%) developed rebleeding in group I, giving overall success rate of 85% (17 patients out of 20). Two patients (7.14%) developed rebleeding in group S and one of them died. Other non-bleeding complications developed in 3 patients in group I and in 14 patients in group S. One patient (5%) died in group I from non-bleeding cause representing the total mortality. Seven patients died in group S from non-bleeding cause giving overall mortality rate of 28.5% (8 out of 28 patients). There were statistically significant differences in complication and mortality rates between the two groups. There was statistically significant difference in the amount of blood transfusion between the study groups. There was no statistically significant difference in the length of the hospital stay. Conclusion: Our results show that endoscopic injection of diluted adrenaline for patients with actively bleeding duodenal ulcer is associated with less complication and mortality rates as well as less amount of blood transfusion in comparison with surgical treatment. AN INTRAMUSCULAR HAEMANGIOMA ASSOCIATED WITH MULTIPLE CAFÉ AU LAIT SPOTS: A CASE REPORT Marzouk Al Bader, Emad K Farid , Bahgat A Thabet Department of Surgery, Vascular Unit, Mubarak Al-Kabeer Hospital , Kuwait . Abstract This report details the diagnosis and management of a 13-years-old girl with an intramuscular haemangioma on the left side of the chest wall associated with multiple cafe au lait spots (CALS). All previous cases of intramuscular haemangioma are present in the literature however none of them seems to be associated with multiple CALS. Therefore, it is difficult to ascertain whether such an association, in an otherwise healthy individual, is a new genetic syndrome or a mere coincidental finding.